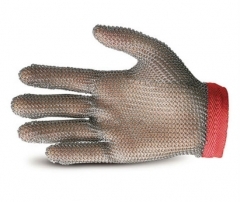 Stainless Steel Mesh Safety Glove provides the ultimate cut and puncture protection. Meets OSHA requirements for meat and poultry processing applications and is ideal for textile and apparel cutting operations. Each stainless steel ring is individually welded for unsurpassed strength. Taper-fit design conforms to the hand, decreasing fatigue while increasing productivity. Patented snap-fastener reversible style changes easily to fit either left or right hand. Select from 3-finger style with palm safety strap or 5-finger style in wrist length. USDA accepted and UL listed. Size available include: S, M & L.